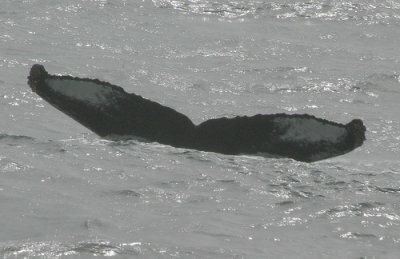 14th May 2010 A photograph of a whale taken by IWDG in Cape Verde in 2006 has just been matched to Iceland. This whale, photographed by Simon Berrow on 3 March 2006 matches an image on the Husavik Whale Museum website taken on 19 June 2008. The match was made by Allied Whale who are the curators of the North Atlantic Humpback Whale catalogue. During the IWDG's Second Humpback Whale Expedition to Cape Verde Islands off West Africa in March/April 2006, we obtained images of 14 individual humpback whales. Prior to this expedition there were less than 60 images of individual whales from Cape Verde and only two known matches. One from 1999 between Cape Verde and Iceland and a second in 2004 from Cape Verde to Bear Island north of Norway. This year (2010) we have made another three matches thanks to the sterling work of Pedrin in Boa Vista who has been taking images from whalewatching vessels. The IWDG also obtained a match of a humpback whale between Ireland and the Netherlands in 2008 but this was between two feeding grounds and not potential breeding areas. It is essential to identify their breeding grounds if we are to ensure humpback whales continue to visit Ireland. The Cape Verde breeding population is very small, with probably less than 100 breeding females and thought to be genetically isolated. A PhD currently underway by IWDG's Conor Ryan at the Galway-Mayo Institute of Technology is hoping to unravel their genetic relationship to Ireland. The IWDG are most interested in whether the humpback whales we record in Ireland are breeding in Cape Verde. It is an intriguing thought as to whether this humpback whale passed through Irish waters on its way from Cape Verde to Iceland. It seems most likely, and we think it's a matter of time before we make the big breakthrough and find the breeding grounds of Irish humpback whales.